The Bard Travel Program is well underway, and we recently received this image from the students who were in England. 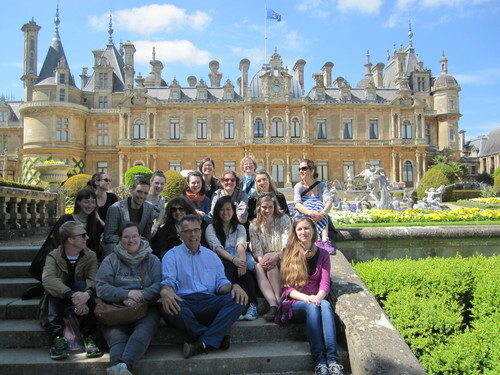 (Half of the students went to London; the other half to Paris ) The program is centered in London, but does offer several day trips, and this one was to Waddesdon Manor, the Rothschild Estate in Kent. Along with faculty members Deborah Krohn and Ulrich Leben, who led the Waddesdon tour, are (bottom row, left to right) Andrew Taggert, Caitlin Dichter, Ulrich Leben, Summer Olsen. In the second row, left to right, are Marietta Klase, Garrett Swanson, Deborah Krohn, Cindy Kok, Caroline O’Connell. Third row includes: Lara Schilling, Christine Griffiths, Sarah Stanle, Amanda Thompson, Clara Boesch, Ana Estrades . On the top step are Kaitlin McClure and Shiela Maloney. The annual trip abroad, led by BGC faculty is for the first year students to study, in situ, many of the objects and kinds of objects they have been studying in the Survey class.